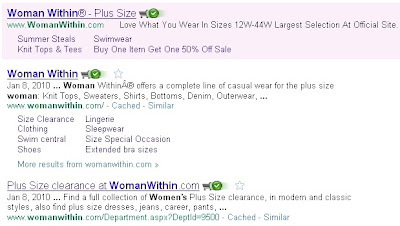 While performing a Google search for womanwithin.org, I inadvertently came across a clothing company with the same name - one that seemed to specifically cater to plus sized women. As I am a plus sized gal, (one who is easily frustrated with clothes shopping,) I clicked the link to check them out. People - if you wish to sell your clothing to the plus sized community, how about using plus-sized models to show how the clothes will really fit? I was so put off by this that I called their customer service number and told them how I felt. That's okay—Lane Bryant posted something about how they want to be all young and stuff, which is great. They just lost me, an "old" customer. Bravo Stephanie! I agree! I feel the same way - and need the larger sizes, too. In this instance I totally agree with you. I can't really relate (not a woman, not plus size), but it's absurd to have non-plus-size women modelling plus-size clothing. On the other hand, I don't agree with all the people wanting "plus-size" women to model most clothing. We shouldn't have too-skinny models either, but we should have healthy models. And neither too-fat or too-skinny is as healthy as we can be.